Strictly speaking Nathaniel Jekyll was a Solicitor of West Coker (just west of Yeovil) but, for completeness since he was listed as a Yeovil solicitor in Pigot's Directory of 1839 and he clearly had very close associations with the coterie of Yeovil lawyers, I have included him here. Nathaniel Jekyll was born 13 July 1808 at West Coker, one of the six children of Rev George Jekyll (c1777-1843), Vicar of West Coker from 1802 until 1843, and Ann Brown of Oxfordshire (d 1851). He was baptised at West Coker, presumably by his father, on 10 August 1808. Nathaniel was educated at Blundell's School, Tiverton, Devon, from 1817 until 1823, and in 1829 entered into a clerkship with Attorney Thomas Moore of Yeovil. In 1828 his sister Charlotte married Solicitor Edwin Newman, later of Hendford Manor. In the 1841 census Nathaniel was listed living in Church Road, West Coker, with his parents and older brother Joseph together with three servants. Nathaniel gave his occupation as Solicitor. On 18 May 1843 at Crewkerne, Nathaniel married Mary Jane Robins, the daughter of carpenter Robert Robins of Crewkerne. They had two children; Joseph Nathaniel Campbell (1843-85), a banker’s clerk, of 22 Prince’s Street, Cavendish Square, London, who died unmarried and Mary Jane (b 1846). As mentioned above, Nathaniel was listed as a Yeovil solicitor in Pigot's Directory of 1839 although he was primarily an Attorney of Coker Hill, West Coker but clearly had strong connections with both Thomas Moore and Edwin Newman. Nathaniel Jekyll died, aged 41, on 9 March 1850. 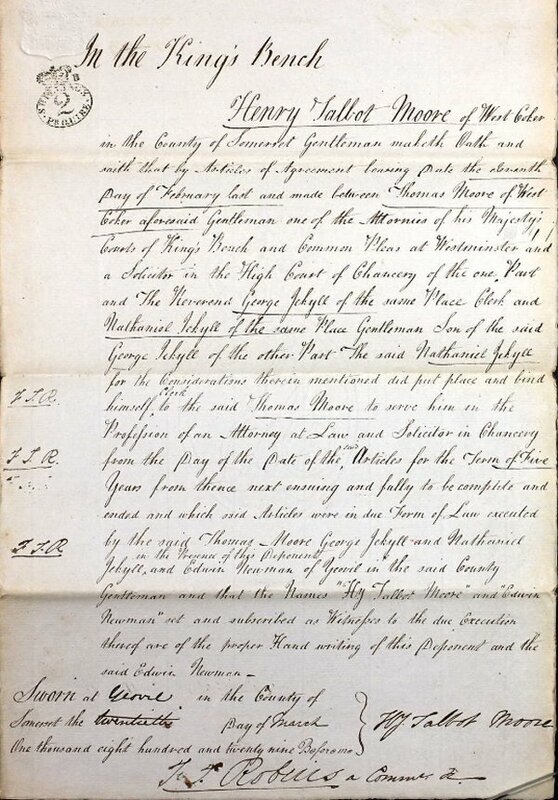 Nathaniel Jekyll's Articles of Clerkship to Thomas Moore of West Coker, signed in Yeovil and dated 20 March 1829. It was witnessed by Yeovil Solicitor Edwin Newman who happened to be Nathaniel's brother-in-law.